We carry all of the best quality brands of tonneau covers, prices as low as $299. Truck bed covers will not only improve the looks of your truck, it will improve its aerodynamics and give you better gas mileage. It can also allow you to use your truck bed as a regular trunk to keep valuables away from view. For any questions on tonneau covers or any other truck accessories, please give us a call. We also carry cargo liners and floor mats by Weathertech. Soft vinyl tarp that rolls open and close with no loose parts. Hard or soft panels that fold in sections. Variety of configurations available. 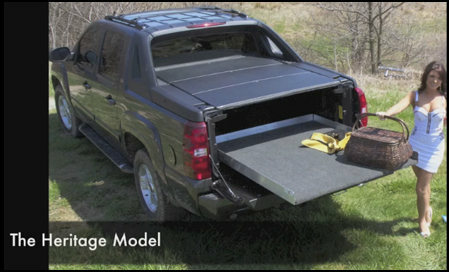 Similar to a trunk lid and covers the entire truck bed, normally hinged at the front. Rolls up in a canister at the front of the cover. Features very good security. Sleek and streamlined look for improved visual appearance. Hard or soft covers available with different configurations available. Normally hard material with built-in locking mechanism for added security. Solid material used such as fiberglass, aluminum or plastic. Best for increased security. Soft fabric available in different styles. Normally the most affordable solution. Toolbox is incorporated with the tonneau cover. Used with soft covers to snap in place. Snapless systems use an alternative method like Velcro. We have been in business for over 30 years selling and installing truck accessories. The new CargoEase retrieval system (image below) is now available, call the store for details.